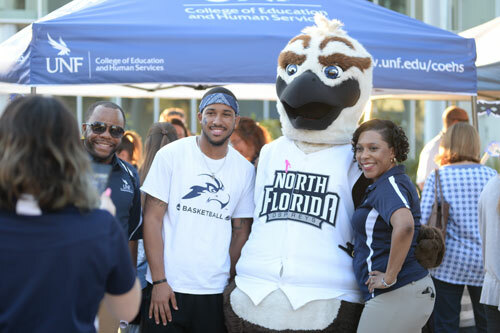 St. Johns River State College, in partnership with the University of North Florida, announces a new articulation agreement providing SJR State graduates with a seamless transition into UNF. The "UNF/SJR State Gateway Program" aligns SJR State's associate in arts degree (transfer degree) with many of UNF's baccalaureate programs. To be eligible for the UNF/SJR State Gateway Program, students must graduate with an associate of arts degree and meet the requirements and prerequisites for the degree being sought as established by the official UNF catalog. Students should refer to the UNF catalog corresponding with their first year of enrollment in the A.A. program at SJR State. The agreement will not apply to limited access programs at UNF or other programs that UNF designates as inapplicable. While SJR State's graduates have always been guaranteed admission to one of the 11 colleges in the state, the UNF/SJR State Gateway Program gives students the convenience of designating UNF as their transfer college with the guarantee of acceptance. Students wishing to apply to the UNF/SJR State Gateway Program must indicate their participation in this program at the time of applying to SJR State. Students currently enrolled at SJR State should contact their campus academic advisor. Interested students should contact an SJR State academic advisory.